At the risk of sounding like a noodle-brained yahoo and offending English majors across the nation, I confess that I am not an Emily Dickinson fan. She sometimes frightens me the way birds do. 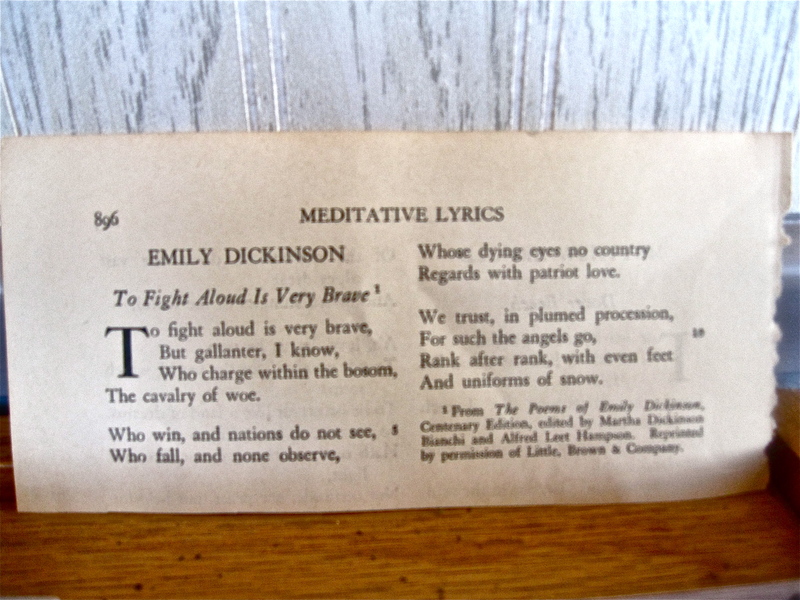 But I was in northern Michigan over Memorial Day weekend with no poems at my disposal except what I could tear out of a 1942 college freshman English textbook I had taken from my father’s collection. There I found “To Fight Aloud Is Very Brave,” a poem I had never read before, and as you will see, have not had much time to consider. I usually get tangled up in Emily Dickinson’s syntax. I lose the thread of her phrases and sentences, where the subject is and what it’s doing, and I end up with a jumbled mess in my head. This poem I was able to understand, at least the first two stanzas. Obviously she didn’t intend the poem as a tribute to the families of fallen soldiers, but that’s what it made me think of this Memorial Day. Today we salute those who gave their lives for our country, but let’s also remember the families who are left behind to fight “within the bosom/the cavalry of woe.” Their silent and unseen battles with grief are brave indeed. On a less serious note: the third stanza has me befuddled. I have no idea what it means. A little help, please, if you get it.